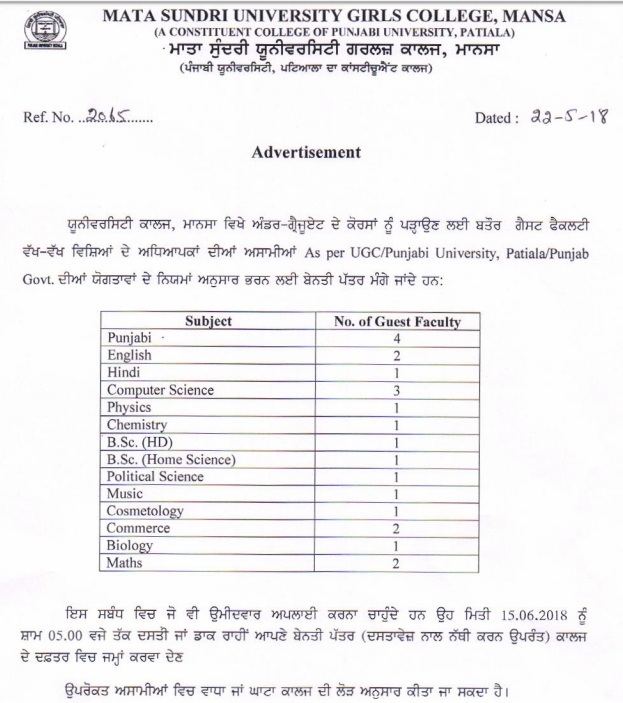 Mata Sundri University Girls College affiliated to Punjabi University Patiala has released Notification to hire guest faculty members vacancies in various subjects. Interested and eligible candidates looking for Latest Teaching Jobs, they can apply for Punjabi University Recruitment 2018. MSUGC is a leading university college, invites applications for the post of guest faculty in commerce, Hindi, English, economics, history, chemistry, and mathematics, who fulfill the eligibility criteria mentioned below. Candidates who want to apply can fill their online application form until 15th June 2018 5:00 PM. Important Details for MSUGC Guest Faculty Jobs 2018 like application fee, educational qualification, age limit, selection process and online application form and notification are mentioned below. Qualification/ Education:- The minimum educational qualification required to apply for MSUGC Recruitment 2018 is according to UGC New Delhi/ Punjabi University, Patiala/ Punjab Govt. Norms. Age Limit:- As per university norms. Detailed age details and relaxation is admissible for candidates of SC/ ST/EXSM/OBC/PWD category and other special categories as per rules are given in official notification. Selection Process:- On the basis of their qualification of applicants, and Interview. Under career, the section goes to Recruitment link.